The prAna Stretch Zion Convertible is the ultimate be-prepared pant. Stretch Zion fabric is water resistant, quick drying, and abrasion resistant - ready to splash through mud and do some impromptu bouldering. A ventilated free-range gusset helps you breathe while allowing complete freedom of movement. Adapt to your environment by zipping legs off to short length when the sun rises high and hot. The versatile prAna Sage Convertible Pant is a friendly traveling companion. Stretch ripstop is water resistant and quick drying, and cargo pockets help you stay prepared. Go full length, use interior tabs to roll up to capri length, or zip off to short length as the day demands. The Halle Convertible Pant features our signature Stretch Zion fabric, which is water repellent, quick drying, UPF 50+. You can zip off the leg to reveal a below the knee knickers. The prAna Monarch Convertible is the only pant you'll need on a long through hike. Abrasion resistant and water resistant Stretch Zion fabric provides amazing durability that shrugs off rain showers and looks for adventure. The convertible legs zip off to knickers if you should find yourself in a bouldering field. Front and back pockets zip closed for security. The prAna halle pant is cut from stretch Zion fabric to wick the skin dry, and woven with a durable water repellent finish. Articulated knees and easy-roll pant legs make this straight leg, mid-rise, relaxed fit pant cross-functional. Complete with a button fly and a hidden zip stash pocket at upper right leg. Multiple inseams available. The prAna Stretch Zion Pant has understated everyday style to go with performance ability for weeks in the wilderness. Stretch fabric is quick drying and resists water, abrasion, and wrinkles. Roll-up leg snaps, a cinch belt system, and a ventilated free-range gusset are ready for rock climbing. 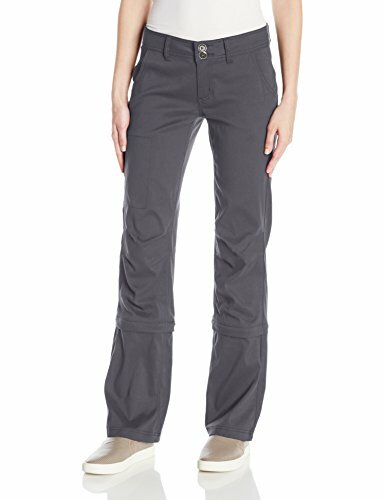 The prAna Zioneer Pant uses classic 5-pocket styling to add everyday stealth to an all-purpose adventure pant. Quick drying stretch fabric is water, wrinkle, and abrasion resistant. A ventilated free-range gusset allows total freedom of movement, and roll-up leg snaps are ready for bouldering. Compare prices on Prana Convertible Pants at ShopPlanetUp.com – use promo codes and coupons for best offers and deals. We work hard to get you amazing deals and collect all available offers online and represent it in one place for the customers. Now our visitors can leverage benefits of big brands and heavy discounts available for that day and for famous brands.